In many parts of our world today, group communication centers on visual materials built with “presentation software,” often crafted by a speaker him or herself. As a result, meetings now generally depend on the use of personal computers, presentation software in the guises of product or service and display by digital projectors or flat-screens. A humorous sample PowerPoint presentation supplied with the very first version in 1987. This clip was created with PowerPoint 1.0 for Mac running in a Mac Plus emulator. So central have these visual materials become that the intended functioning of digital files, programs, computers, and peripherals has become an almost necessary condition for public communication. Choice of presentation software has even become a mark of generational and other identities, as in whether one uses Facebook or Snapchat. Millennials and Generation Z choose Google Slides or Prezi. Everyone else uses PowerPoint, its mirror-twin by Apple called Keynote, or, for political expression and/or economic necessity, LibreOffice. Membership in a highly technical community can be signified by using the typesetting program LaTeX to build equation-heavy slides. Further, many of PowerPoint’s most familiar characteristics—the central motif of a slide containing text and graphics, bulleted lists, the slide show, the slide sorter, and even showy animated transitions between slides—were not absolute novelties when PowerPoint appeared. These elements had been introduced in one form or another in earlier presentation software. 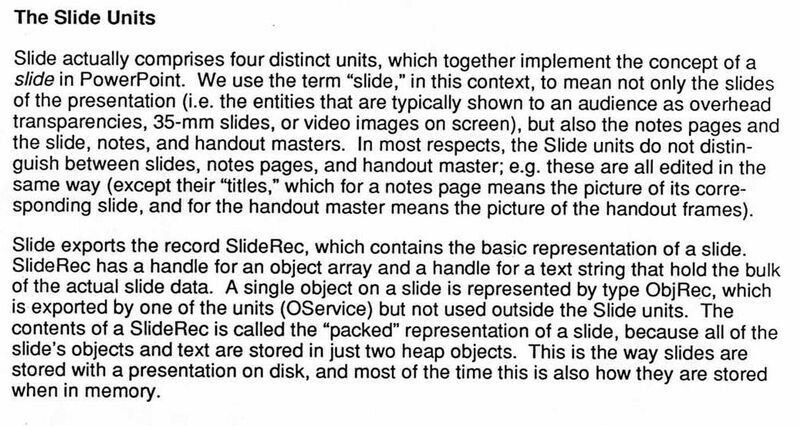 Here, the principal developers of PowerPoint—Dennis Austin and Tom Rudkin—describe the structure of the source code defining slides. Austin and Rudkin worked closely with the product’s architect, Bob Gaskins. This document is in a collection of materials donated to the Computer History Museum by Dennis Austin. Early presentation software was most commonly used to create overhead presentations. In this clip, Dennis Austin—a principal developer of PowerPoint—demonstrates the use of overhead projectors and presentations. The six years from 1982 through 1987 saw the emergence of presentation software (including PowerPoint), with multiple makers introducing competing programs offering many similar capabilities and idioms. Why did multiple, independent software creators develop presentation software for personal computers at just this moment? This framework distinguishes different types of contextual challenges that shape the creation of new materials and manufacturing processes: the materiality of substances, tools, and fabrication techniques (referred to as “material logic”); the needs, demands and interests of intended customers (“market logic”); and the competitive tensions among laboratories, firms, and nations (“competitive logic”). These material, market, and competitive logics are not determinative, in the sense that they do not lead to necessary outcomes. But they are particularly stable over time and provide powerful resources and constraints to innovators and their patrons. The implication seems straightforward: People from similar backgrounds, in similar organizations, facing a common, structured set of contextual logics, will do similar—but not identical—things. But can these logics that help make sense of the history of semiconductor electronics, a technology deeply about materials, also give insights into the history of the ne plus ultra of the digital—software itself? I think it can. Competitive logic, Market logic, and Material logic: Let’s consider them in that order, and see what they can mean for the “prehistory” of PowerPoint. Competitive logic centered on software makers. 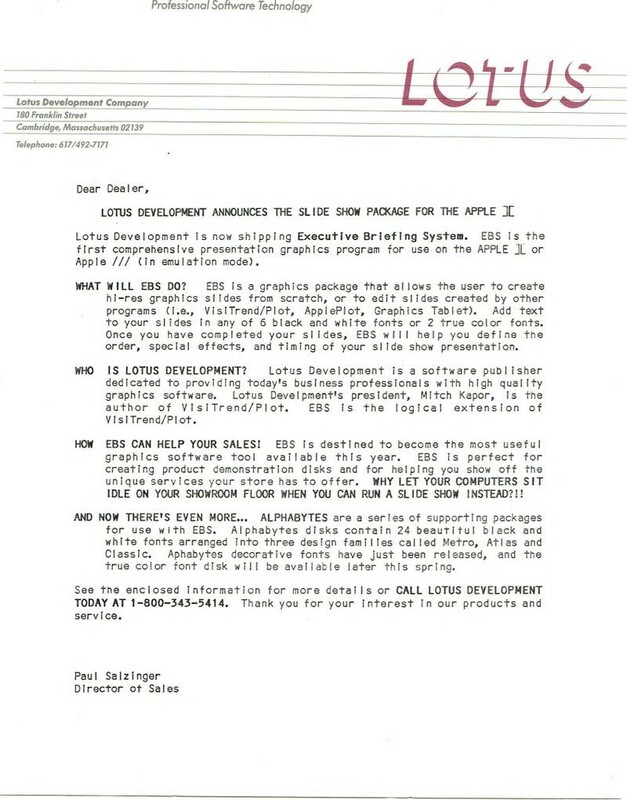 In the first half of the 1980s, makers of presentation software were typically connected to companies. There were, of course, makers of non-commercial software of various stripes—hobbyist, open source, libre and the like—but they do not appear to have been a factor in early presentation software. Rather, the makers of presentation software were what I call “integrated software manufacturers,” “software publishers,” and “author houses.” Sometimes the boundaries between these maker-types are blurry, but I think the categories are useful. Integrated software manufacturers, ranging from cottage firms to public companies, wrote code, manufactured it mainly on magnetic media, wrote and printed technical documentation and guides, and distributed it in shrink-wrapped boxes. For integrated software manufacturers of this era, think of Microsoft, Lotus Development, and MicroPro International. “Software publishers” did everything that the integrated manufacturers did, except write the code. Rather, they entered into contracts on a royalty basis with those who did write programs. Software publishers ran the gamut from stand-alone companies like Personal Software Inc. and the aptly named Software Publishing Inc., to computer makers like Apple, who published software written by others under their own label. Code authors ranged from individual sole proprietorships to “author shops,” partnerships between two or more programmers in an LLP or a small company. The origins of Microsoft, perhaps the best-known integrated software manufacturer. “Market logic” centered on the intended users of software, and, in the case of presentation software, focused to the communication practices of white-collar workers in the United States (and, perhaps, elsewhere), particularly “managers” and “executives.” Contemporary commentators noted that personal-computer “business” software like spreadsheets represented a turn in “office automation,” the opening of a new phase in which software users would expand beyond specialists and secretaries to managers and executives. Personal computers with new software would be in the offices of Mahogany Row in addition to the accounting department and the typing pool. In this 1979 commercial, Xerox presented just this vision of the office of the future. 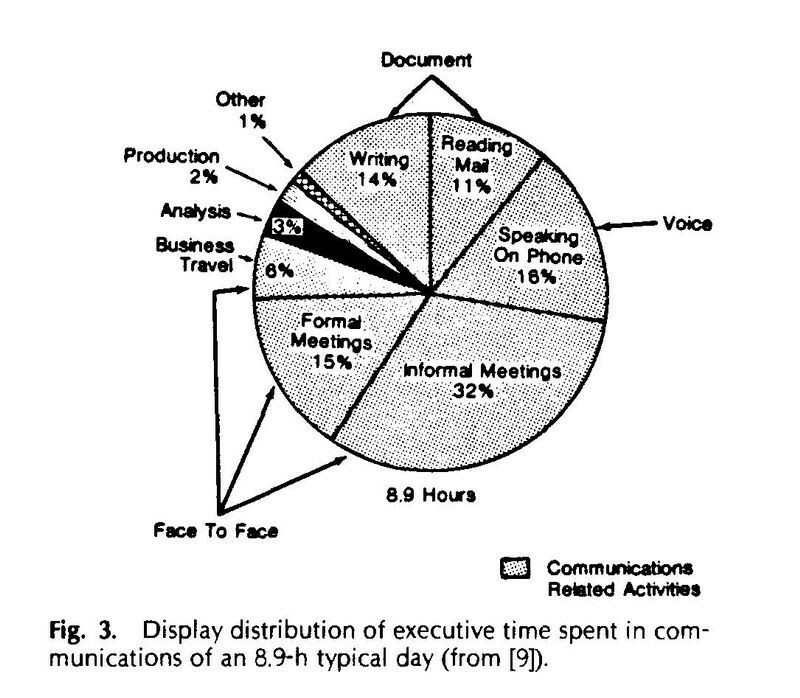 Toong and Gupta’s diagram of the proportion of an “executive’s” time spent in meetings. © 1984 IEEE. Reprinted, with permission, from Proceedings of the IEEE. Toong and Gupta then discuss a newly released example of such “presentation graphics software,” VCN ExecuVision, offered by the book publisher Prentice-Hall. VCN ExecuVision, which ran on the IBM PC, cost $400 but also required libraries of images and icons, that is, “clip art,” at $90 per floppy disk. Users could create “slide shows” of multiple “slides” that the user could craft with text, clip art, and geometric shapes, as well as pie, bar, and line graphs, with the completed slide show either printed or displayed on the PC monitor. The idiom of the slide was directly adapted from the world of 35mm photographic slides. “Seeing a single slide is one thing,” Toong and Gupta write, “seeing an aggregate of slides is another. VCN ExecuVision supports slide shows in which the transition from one slide to another can be controlled either manually (pressing a key causes display of the next slide) or automatically… More significant is the support of animation techniques which give an illusion of seeing a running movie rather than a slide show…VCN ExecuVision brings sophisticated graphical capabilities to the realm of personal computers thus vastly expanding the horizons of personal computer applications in all four domains – office, home, science, and education.” Continuing their celebration of ExecuVision, Toong and Gupta illustrated their journal article with three full-color pages of ExecuVision slides, replete with images having the unmistakable aesthetic of clip art. Presentation software and clip art may have been born together. Sample slides from VCN ExecuVision. © 1984 IEEE. Reprinted, with permission, from Proceedings of the IEEE. Toong’s ExecuVision was, in late 1983, a new entrant into the presentation software market that two new integrated software manufacturers, located in neighborhoods on opposing sides of the MIT campus, had already enjoined. On one side was Mitch Kapor’s startup, Lotus Development. Kapor created his new firm on a windfall from two programs he had written that were published by Personal Software, Inc., later renamed VisiCorp. VisiCorp was also the publisher of the breakthrough spreadsheet program VisiCalc, written in Cambridge by Software Arts Inc., the “author shop” of Dan Bricklin and Bob Frankston. Lotus’ announcement of Executive Briefing System. Courtesy of the Kapor Archive. An early Executive Briefing System demonstration. This clip was created by running an image of the demonstration disk in an Apple II emulator. A 2015 CHM oral history interview with David Solomont. 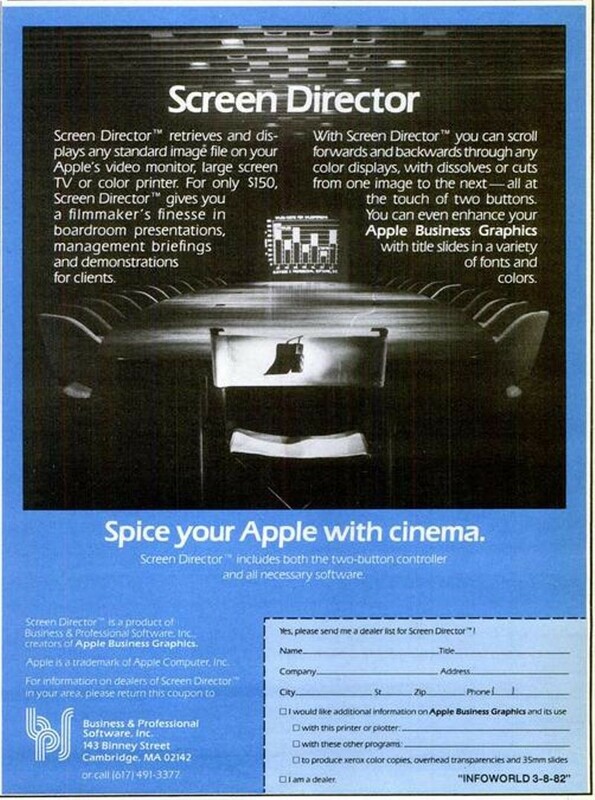 A 1982 print advertisement for Business and Professional Software’s Screen Director program. So far I have described a meaning for “competitive logic” and “market logic” in the case of presentation software, and some early programs from 1982 through 1984. But what of “material logic?” Material logic here includes personal computers themselves, specifically personal computers with graphics capabilities that were expanding in the early 1980s. The computers’ physical performativity, their material agency, constituted a resource, medium, and constraint for software makers and users. Existing programs widely used on these computers, like spreadsheets and plotting programs, were themselves a critical part of the material logic. Software, like hardware, has an unavoidable materiality. At the most abstract, a computer program can be considered to be a specific pattern. In practice, every instance of a program is a pattern in something material, including the body of an author. 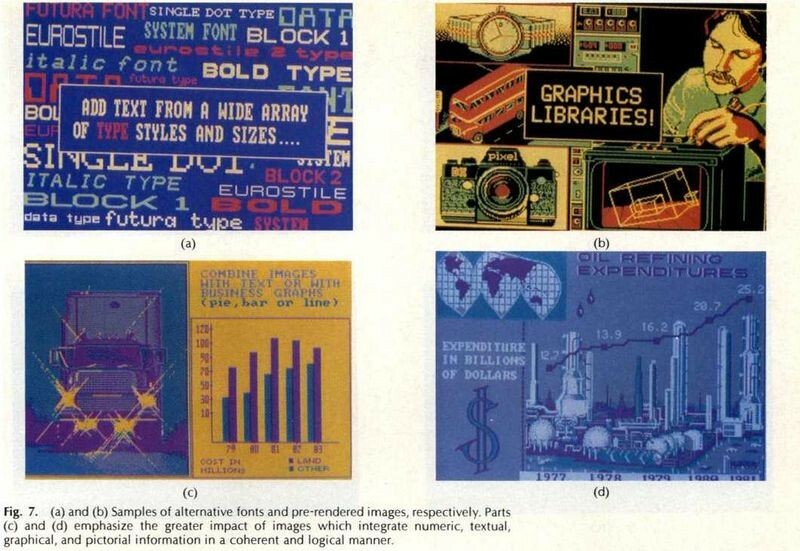 This material logic was especially important in the creation of PowerPoint. In 1983, two Apple managers, Rob Campbell and Taylor Pohlman, left the firm and created a new integrated software manufacturer, Forethought Inc. Simply put, they left Apple to bring a Xerox Alto like GUI operating system to the IBM PC. By 1986, however, Forethought Inc. had a change of plans. This story—of Forethought’s creation of PowerPoint—and other stories about what PowerPoint and its competitors can tell us about software history, will be the subjects of upcoming essays by me on the @CHM blog. For more information about the development of PowerPoint, please see our Guide to the Dennis Austin PowerPoint Records. 1. Oral history interview with Shawn Villaron, PowerPoint manager at Microsoft, date, forthcoming/in process. 2. Indeed, a wonderfully helpful list of presentation software offerings from 1986 compiled by Robert Gaskins, the initiator and architect of the original PowerPoint project, can be found on pages 131-134 of his painstakingly detailed and comprehensive memoir, Sweating Bullets. 3. One place in which these identifying names for the presentation software genre were evident was, and is, the pages of the trade magazine InfoWorld. Google Books has a large number of issues of the periodical available with full text and search. On the more general use of the genre names, see this Google Books NGram. 4. See Christophe Lécuyer and David C. Brock, Makers of the Microchip: A Documentary History of Fairchild Semiconductor (Cambridge, MA: MIT Press, 2010); David C. Brock and Christophe Lécuyer, “Digital Foundations: The Making of Silicon Gate Manufacturing Technology,” Technology and Culture, 53 (2012): 561–97; and Christophe Lécuyer and Takahiro Ueyama, “The Logics of Materials Innovation: The Case of Gallium Nitride and Blue Light Emitting Diodes,” Historical Studies in the Natural Sciences, 43 (2013): 243-280. 5. See, for example, Martin Campbell-Kelly, “Number Crunching without Programming: The Evolution of Spreadsheet Usability,” IEEE Annals of the History of Computing, 29 3 (July-September 2007): 6-19 and Thomas J. Bergin, “The Origins of Word Processing Software for Personal Computers: 1976-1985,” IEEE Annals of the History of Computing, 28 4 (October-December 2006): 32-47. 6. The article may be viewed in InfoWord on Google Books. 7. Hoo-Min D. Toong and Amar Gupta, “A New Direction in Personal Computer Software,” Proceedings of the IEEE, 72 3 (March 1984): 377-388. 8. Commonwealth of Massachusetts, Articles of Organization, Visual Communications Network, Inc., October 13, 1983. 9. Mitch Kapor, “Reflections of Lotus 1-2-3: Benchmark for Spreadsheet Software,” IEEE Annals of the History of Computing, 29 3 (July-September 2007): 32-40; David C. Brock telephone call with Todd Agulnick, July 15, 2016. 10. Rik Jadrnicek, “Executive Briefing System, a slide-show program,” InfoWorld, May 17, 1982, 47–49. 11. Oral History of David Solomont, Computer History Museum, 2015. Or watch it on YouTube. 12. Richard Hart, “Screen Director helps you present ‘slide shows,’” InfoWorld, November 8, 1982. 13. See Michael Hiltzik, Dealers of Lightning: Xerox PARC and the Dawn of the Comptuer Age, (New York: HarperCollins), 1999.